A few years ago, standing on top of a peak in the Bernes Alps, I was suddenly blown away by the beauty of the mountains. I've spent my life climbing and being in the mountains so this sudden realisation might seem odd to some, but it was at that moment I decided to take on one of the biggest challenges of my life. Commonly referred to as the 82 4000ers, the Alps has 82 summits above 4000m spread across Switzerland, Italy and France. Each and every one is unique and can range from relatively easy ascents to highly technical winter climbing. In March 2017, I made it my mission to climb them all. Being a skier, an Alpinist and a paraglider, it quickly become obvious that I would ski some, paraglide off of others and climb the rest as summer alpine routes. But I also made the decision to not use any lifts or cables and to share this project with as many friends as possible. Before starting the project, which we called 'Liv Along the Way', I told myself it was like going on one big expedition... I had no idea I would be so wrong! I travelled on foot, skis and paraglider. Covered 920km and gained 110,000m in vertical ascent and shared it all with 22 amazingly talented and supportive friends. 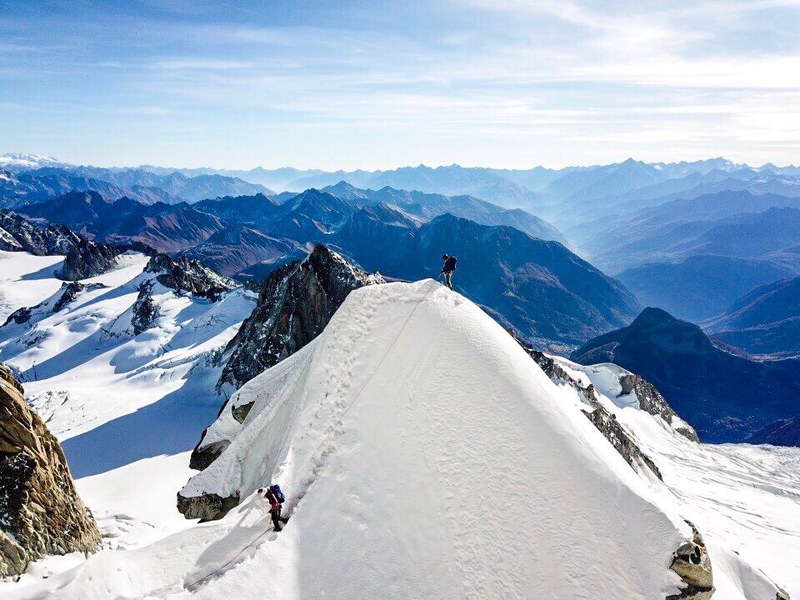 Liv Sansoz and Mathéo Jacquemoud climbing the famous "Demi Lune" section on the Kuffner Ridge. Credit: Mathis Dumas. When you work on a project like this, you make the ideal plan, knowing it will change and knowing you'll have to constantly adapt yourself and be as flexible as possible. You always try to create a rough idea of the valleys and glaciers in your head before travelling to the next summit attempt. Of course, this isn't always as easy as it seems. Once you get there, you have to update your knowledge of the area very quickly, adapt yourself to the terrain and conditions. You can do this in many different ways including speaking to locals to get some advice about recent activity and using different tools to understand the mountains, make plans and follow them when climbing. To solve the challenge of route selection, I came up with a simple rule: stick to the normal routes in winter and travel on skis and pick up more technical routes in summer, depending on the conditions, the group I'll be with and my level of fatigue. For instance, climbing the normal route to reach the Mont Maudit had not much interest for me and I chose to do the very aesthetic Kuffner Ridge and fly off the summits with the glider. On the other hand, we chose to climb the normal routes between Lyskamm and six other 4000m peaks in the Monte Rosa range. When you're travelling across traverses and summiting several different peaks, it's crucial to know your precise location and get an idea of either the ridge or a slope I was one or the next. Many of these I had never seen before so it was important to get a good visualisation of them before agreeing the with the group the best course of action. There are a lot of factors to take in consideration in a project like this one. You have to be prepared both physically and mentally and ensure you have a great support network. You must constantly understand the ever-changing nature of the weather and understand every forecast. Spending that much time in exposed terrain means you must be confident in your assessments of the conditions. Fatigue can be extremely difficult to deal with. Not only can it cloud your judgement but it can slow your pace. I cannot express enough the importance of understanding your body and your limits. In more practical terms, coping with painful feet pretty much every day was mentally draining. Sometimes, everything was going easy, not too long days, good conditions, really nice weather, feeling strong. Some other times, things got much harder. It's all about keeping balanced and focussing on your next summit. 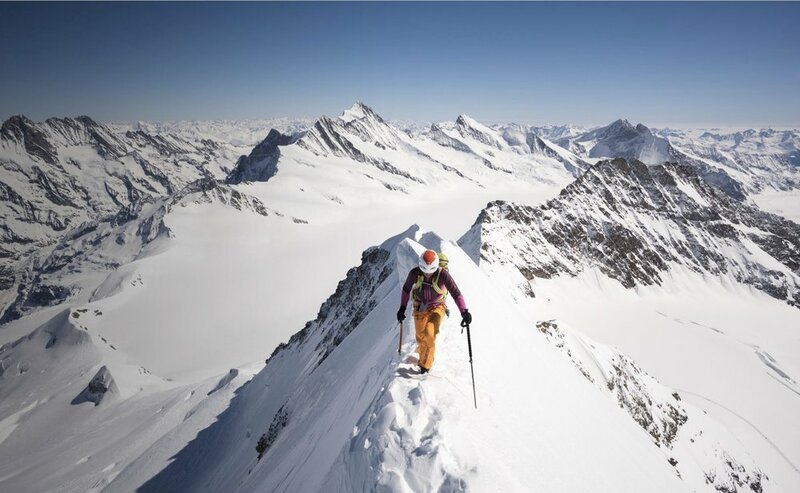 For instance, when we attempted the Schreckhorn Lauteraarhorn traverse, it was supposed to take us 2 days but due to recent snow fall on the ridge we ended up spending 4 days out there. And on the same morning we descended, we had to hike back up 2000m to reach a hut and go for another 2 days climb! Not to mention dealing with my third very cold and uncomfortable bivy in as many days! You might ask the question "why put yourself through all that? ", but the answer is very simple. Those moments are some of my best memories. "We only have one life... so go live it!" 'Liv Along the Way' was supported by Salomon and FATMAP (along with other great brands). It was amazing to follow Liv's progress via her amazing Instagram feed and we highly recommend checking out the resulting film below. To discover more about the project and see the maps Liv used along the way (sorry - we couldn't resist), then head to the official website.